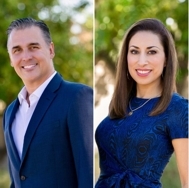 Mike & Maria consistently garner testimonials of high praise and referrals from their clients and business associates for providing the highest level of service with efficiency and expertise. We have an extensive “Buyer Finder” marketing plan designed to be aggressive in showcasing your home in a variety of methods and places. Check out our “For Sellers" page to learn more, and don't forget to contact us so we can sit down and make a plan, tailored to your needs.